This question has always had a negative connotation, but within this Bible Study Guide you will learn the importance of having your brain washed! Life is full of experiences that are stored in our brains that are a filter for how we see ourselves, the world we live in, our relationship with others, and most importantly how we see God! Scientists have discovered that we actually have two brains: the brain in our heads (the cranial brain—learn and remember), and the brain in our hearts (sense and feel). According to research, the brain in the head is connected to the brain in the heart. The two brains send messages to each other through thousands of neurons and tiny filaments, but the messages don’t necessarily coincide. The Bible says in Proverbs 23:7 that as a man “thinks in his heart,” so is he. So, the truth in God’s Word needs to work its way down (18 inches) from the brain in our head to the brain in our heart so that we can experience its life changing power. Included with the Bible Study Guide is a welcome video which you can view here! This study has been designed for individual use as well as applying it to a Small Group. This study has been designed for individual use as well as applying it to a Small Group. To assist you in your study, the Bible Study Guide includes questions entitled Thoughts from the Heart at the end of each lesson. These exercises will hopefully challenge you to study further and apply God’s Word to your personal life. In addition, there are Questions for Small Group Discussion, which are formulated to get your Small Group talking about the key issues in each lesson. Let’s start to take the eighteen-inch journey from your head down into the deep valley of your heart, so you can slay the giants that are defying God’s promises and blocking your blessings! 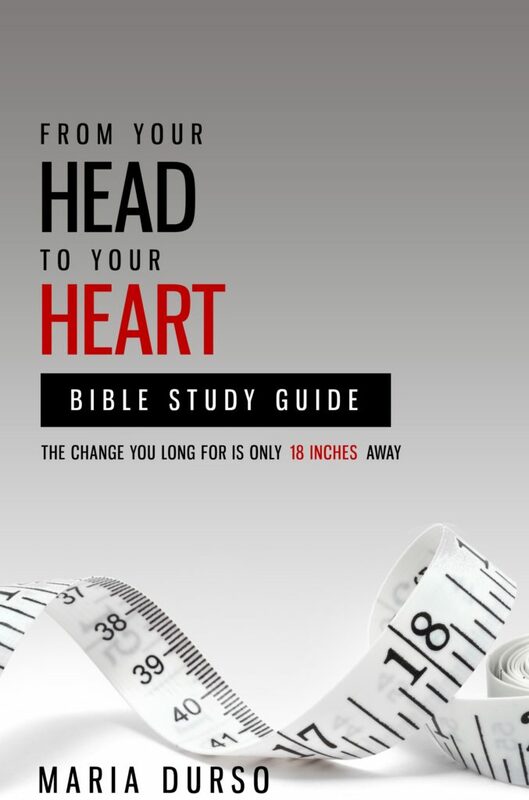 From Your Head to Your Heart Bible Study Guide Welcome Video from Maria Durso on Vimeo.